Description: 33x10 deck looking over greenbelt! I can see for miles & miles! 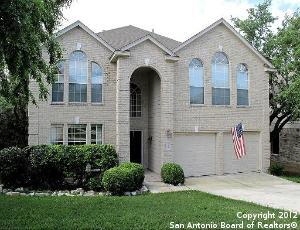 Beautiful 2 story in gated & prestigous redland estates! Lush backyard! Enter to enjoy canyon views! No carpet! High end wood laminate or tile floors! Chefs kitchen opens to family room w/gas fireplace! Stainless steel appliances! 5th bedroom down with walk in shower! Awesome master w/ his & her counters, deep garden tub, walk in shower & sitting area! 19x16 family room upstairs divides bedrooms for privacy! Impressive windows! Get here first!